I have a fear of heights. I cannot stand near the edge of a balcony even three stories high and lean against the railing. In glass elevators, I stand way back, close to the door and close my eyes. One time, I got stuck at the top of a Ferris wheel, and thought I was going to have a full-blown panic attack. 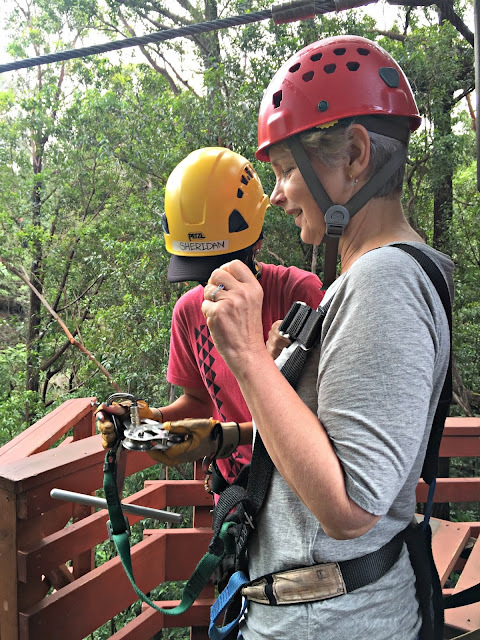 So why, oh why, did I sign us up for a 7-line treetop zipline adventure on our recent trip to Hawaii? As in, ascending to a platform five stories high, stepping off the edge of it, and careening over a canyon at least 10 stories deep? And doing that six more times? And, of course, before we left I started researching zipline safety on the web. Just to reassure myself. Right. That story of the woman who fell 150 feet to her death. Of course, she wasn't wearing a harness, and we would be. But still. I had trouble getting to sleep a couple nights, let me tell you. Oh, and then, the morning before our adventure, there was an article in the Maui News, delivered to our doorstep, on zipline safety. Was it a sign? After we got our helmets and harnesses on, and took a couple pictures, I told my husband we could leave. Just show the pics to everyone; no one would be the wiser. You see, I had made such a big deal about our ziplining plans to everyone, I guess trying to seem daring and adventurous, that I knew I would be embarrassed to say I'd chickened out. But, with fear and trembling, I geared myself up. We headed with the rest of our group over to the ramp and staircase, up to the first platform, high in a giant eucalyptus tree. So my turn came. With shaky legs, I stood at the edge, at the edge of The Abyss. That first step off was the worst. But then . . . it was okay. The next run was a little easier. By the seventh run, I was hands free, twirling around, and thoroughly enjoying myself! Lesson learned? Face your fears. You just might be surprised. I think I can handle a stalled Ferris wheel after this. ** Except one poor girl, on her honeymoon, and not very happy. She was very nervous, and clearly not enjoying herself. I heard her say to her new husband, without a touch of humor, "You owe me a present after this." It as fun, wasn't it, Deborah?! I noticed no gloves - I hoped they provided those for you? Yes, it is amazing how we might surprise ourselves by facing our fears. Congrats. Good for you Deborah. I too am afraid of heights but would like to try this after seeing Oprah do it a few years ago on her show and saying how much fun it was. Well, you are braver than I, my friend! You couldn't pay me to do that! My DIL and son thrive on doing things like that and that's fine for them. But I will keep my feet on the ground, thank you very much. It's hard enough to get me on a plane to go see them. 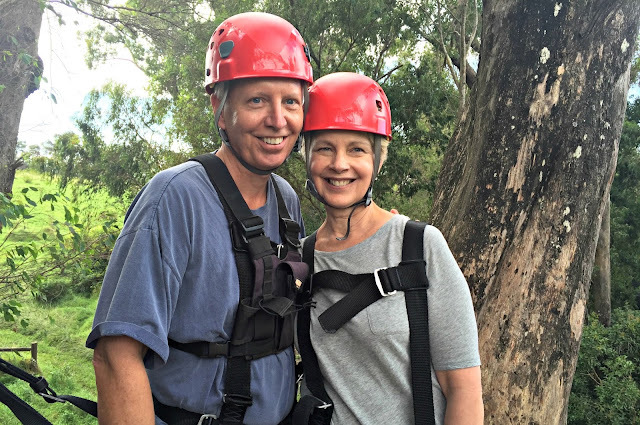 Congratulations for overcoming your fear, Deborah! Way to go, girl! Oh dear, I've always been just as you described with fear of heights and ferris wheels. I had butterflies in my stomach just reading your post. But I'm so proud of you! Fantastic, Deborah! 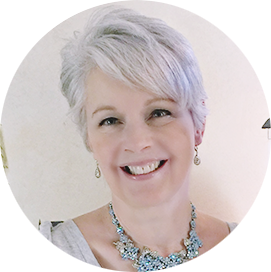 Way to go, Deborah! I wouldn't be able to do that, I don't think. I don't like Ferris wheels and I don't like overpasses on the freeway when someone else is driving!! You're brave, my friend! Good sweet friend! I'm glad you did and could. I'm sure it was such a fabulous and exciting experience for you too! Yes, you are brave, me, I don't go into Ferris wheels at Disney with my grands, either, so wow. You look like a kid having fun. Wow is all I can say... You have done something that you both will never forget, and to do it together on a once in a lifetime vacation in a world of beauty. Face your fears. You did it friend, and survived to tell the tale. Well done. Oh Deborah, you were so brave to do that! I have a fear of heights also and did zip lining in Australia and I did it but cried and screamed the whole time! I did it to but was so scared and I really did not enjoy it but like you I faced my fears too. How wonderful to have gone on a trip to Hawaii! Congratulations, you certainly faced your fears full on, well done. BRAVO!!!!!! You did it! Yay! Whoo hoo! How awesome a lesson. You have nerve lady,I wouldn't ever be able to do that! Such courage! : - ) I am so happy for you, and so proud of you! Way to go!!! Facing our fears is a hard thing to do. What a great memory though, you DID it. You look so young and a bit mischievous and I am very proud of you! My late first husband and my Mom had fear of heights. They both stayed down at the Eiffel Tower when I went up with my Dad. Pieter has no fear either so now both of us can go at it. Oh wow Deborah, you are very brave. Good for you. I don't know if I would take the plunge since I too have a tremendous fear of heights. I did have a panic attack while in Mexico climbing one of the pyramids at Chichen Itza which I will never forget. And it happened again while at the Eiffel Tower in Paris so I think it is safe to say that I will stay away from heights for now. But I am so proud of you. You are inspiration for us all. 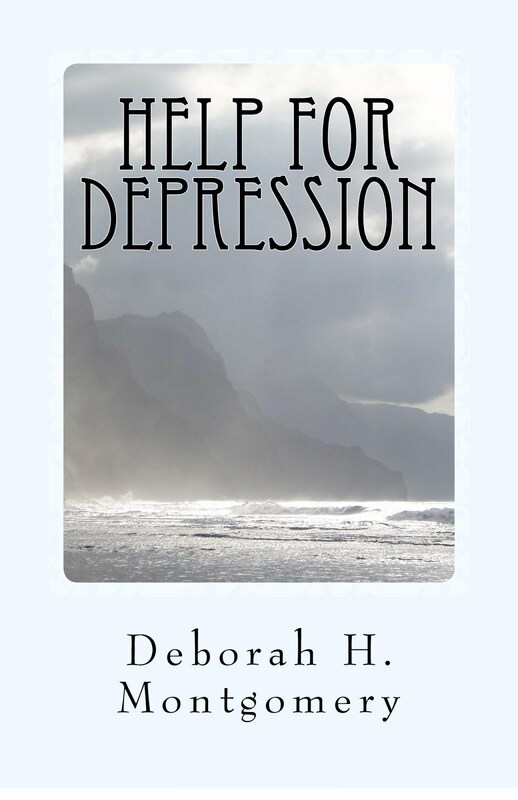 Hi Deborah, you are a brave girl and I can imagine you had a lot of fun once you started going. I don't like heights so I'm not sure I could do this. Love your pics. Your trip was amazing. Have a great week ahead. You're so cute, and so TINY! :) Love this. 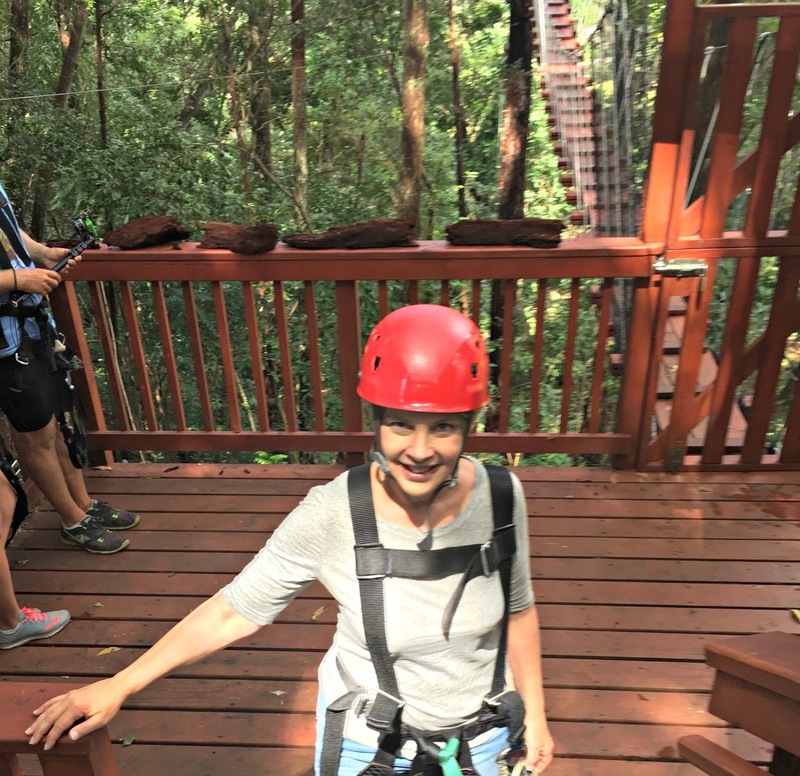 I don't like heights either but have always thought I might enjoy zip-lining. Haven't been brave enough yet, but who knows what the future holds? You were one brave woman and I know you're proud of yourself. Congratulations on bravely doing the zip-line! It sounds like a lot of fun! My family and I actually all love heights, the higher we can get the better! So I'm sure we'd love the adventure...but it could be pretty tough for someone who does not enjoy heights!